What do I do if I find a lost or injured animal or bird? Baby Bunnies (Hares): They are probably NOT orphaned just because they are alone!! DO NOT TOUCH THEM!! – see Species Information about how Mom protects them by leaving them alone. Baby deer – Fawns: They are NOT abandoned if you find them alone in the bushes!! DO NOT TOUCH THEM!!! 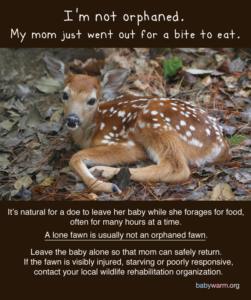 – see Species Information for more information about how Mom cares for her fawns. Fledgling Birds: They may not fly very well, because they are still learning how! – but they are probably NOT injured. Watch and Wait to see if they REALLY need us to help them.